WASHINGTON, Jul 30 2013 (IPS) - Within days of the inauguration of Hassan Rouhani as Iran’s new president, both Tehran and Washington appear to be sending positive signals to each other. The latest came Monday in a flurry of reports from Iran that its former ambassador to the United Nations, Mohammad Javad Zarif, is Rouhani’s pick as his foreign minister. “If true, this is a pretty big signal,” according to Alireza Nader, an Iran specialist at the RAND Corporation, a prominent Washington think tank. “Zarif is more pragmatic than ideological, and if Rouhani intends to improve Iran’s relations with the rest of the world and find a diplomatic solution to the nuclear crisis, then he’s a logical choice,” Nader told IPS. “He really knows the American scene and American politics,” added Gary Sick, an Iran expert at Columbia University in New York, where he became well-acquainted with Zarif during the latter’s five-year tenure at the U.N. (2002-2007). The reports of Zarif’s impending appointment followed a New York Times report Friday that Iraqi Prime Minister Nuri al-Maliki has quietly communicated Rouhani’s interest in quickly engaging in direct talks with the U.S. after his inauguration. They also followed the Barack Obama administration’s announcement late last week that it was easing restrictions on the sale of medical supplies and agricultural products, as well as the provision of humanitarian aid for Iran, in what was taken by many observers here as a goodwill gesture in advance of Rouhani’s formal inauguration Aug. 3-4. In addition, administration officials have become somewhat more outspoken – albeit on background – over the past two weeks in opposing new anti-Iran sanctions legislation that may reach the floor of the Republican-led House of Representative as early as Wednesday. The administration and its allies in Congress are worried that new sanctions would only strengthen hardliners in Tehran and undermine prospects for progress in negotiations over Iran’s nuclear programme between Tehran and the so-called P5+1 (the U.S., Britain, France, Russia and China plus Germany) that are thought likely to resume in September. The pending bill, which has been strongly pushed by the powerful American-Israel Public Affairs Committee (AIPAC), the vanguard of the Israel lobby here, seeks to impose a de facto ban on Iran’s oil exports, cut off any trade involving the euro, and target Tehran’s shipping and automobile sectors. It would also curtail Obama’s ability to waive sanctions on third countries and their companies that continue to do business with Iran. The push to get the bill through the House before Rouhani’s inauguration and before the August Congressional recess followed an appeal by Israeli Prime Minister Benjamin Netanyahu on a widely viewed U.S. public-affairs television programme two weeks ago to increase pressure, including “credible” threats of military action, on Iran to abandon its nuclear programme. Netanyahu called Rouhani a “wolf in sheep’s clothing”. While the measure may indeed pass the House this week, it is likely to do so by a less lopsided margin than had been anticipated before Netanyahu’s bellicose appearance, however. Five days after Netanyahu’s appearance, 131 House members, including 17 Republicans, signed a letter urging Obama to “reinvigorate(e) U.S. efforts to secure a negotiated nuclear agreement” in light of the “potential opportunity” presented by the election of Rouhani, who stressed the importance of easing tensions with Iran’s neighbours and the West during and after the campaign. The letter also suggested that Washington should be prepared to relax bilateral and multilateral sanctions against Iran in exchange for “significant and verifiable concessions” at the negotiating table and implicitly warned against adding new sanctions at such a sensitive moment. Some of the signers are now calling on their colleagues to delay the vote or at least amend the bill in order to expand, rather than restrict, Obama’s authority to waive sanctions if it should eventually pass. A similar letter authored by California Democrat and Senate Intelligence Committee chair Dianne Feinstein is reportedly now circulating in the Democrat-led upper chamber, which, in any event, is considered unlikely to act on any new sanctions legislation until autumn at the earliest, if not after the new year, according to Senate aides. Meanwhile, a number of European diplomats who dealt with Rouhani in the early 2000s when he was in charge of Iran’s nuclear portfolio have stressed that his presidency offers a major opportunity for a breakthrough on that front. In an op-ed published by the International Herald Tribune late last week, former French Ambassador to Iran, Francois Nicoullaud (2001-2006), wrote that Rouhani played the central role not only in reaching an agreement with the EU-3 (France, Britain and Germany) that resulted in Tehran’s suspending its uranium enrichment programme, but also in terminating an alleged secret weaponisation programme run by the Revolutionary Guards (IRGC). Zarif’s appointment would be considered consistent with the growing conviction here that Rouhani is someone with whom Washington can indeed do business, not just on the nuclear file, but also with respect to key regional issues, including Afghanistan and Iraq. He made powerful acquaintances, including then-senators Feinstein, Joe Biden, Chuck Hagel, during his U.N. tenure, although his contacts with U.S. diplomats date back all the way to the 1980s when he helped negotiate the release of U.S. hostages in Lebanon. Citing his talks with Zarif, now-Pentagon chief Hagel called for “direct engagement” between Washington and Tehran. Amb. James Dobbins, who was recently appointed as Obama’s chief aide on Afghanistan and Pakistan, has spoken highly of Zarif’s role in brokering the Bonn accord that followed the Taliban’s ouster from power in Afghanistan. 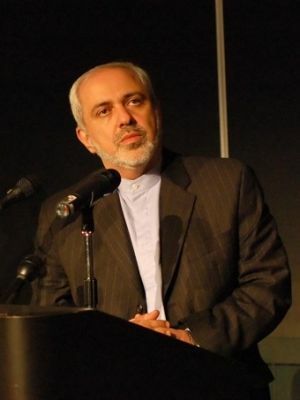 Zarif also reportedly played a key role in drafting a 2003 proposal for a “grand bargain” between Iran and the U.S. covering all outstanding issues between the two countries that was secretly conveyed to Washington via the Swiss ambassador in Tehran – only to be ignored by a triumphalist George W. Bush administration emboldened by its speedy, albeit ultimately and illusory, conquest of neighbouring Iraq. If he is indeed nominated, he must still be approved by the Parliament, where he could face strong opposition from hard-liners due to his close association with former President Mohammad Khatami, according to experts here. As with other major foreign-policy decisions, his fate could ultimately be decided by the Supreme Leader, Ayatollah Khamenei. “Zarif is closely associated with Khatami, and the ultra-conservatives … hate Khatami. Looking at Rouhani’s reported list of cabinet ministers, Zarif can be considered to be the candidate most closely aligned with the reformists. He is probably one of the best candidates to deal with the West, but perhaps the candidate most susceptible to political intrigue,” Nader said.